Everything you need to know about growing a heirloom crop- the Sugod-Sugod. The sugod-sugod (Momordicacochinchinensis [Lour.] Spreng) is a vegetable indigenous to Southeast Asia. 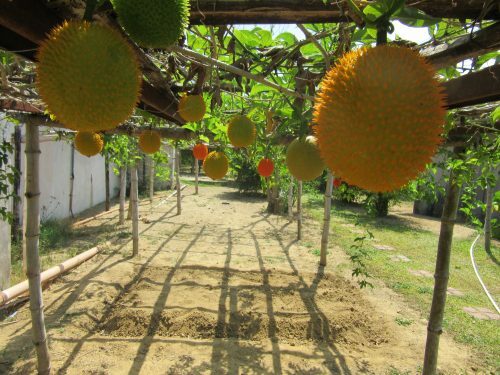 It is a perennial, dioecious plant (with separate male and female plants) belonging to family Cucurbitaceae and is adapted to tropical and temperate climate conditions. In the Philippines, it is known as “Sugod-sugod” or “Balbas-bakiro.” Other names include Cochinchin gourd, gac (Vietnam), Fak kao (Thailand), Bhat Kerala (India), Moc Niet Tu (China), and Mak kao (Laos). It grows as a perennial vine and bears round to oblong dark orange fruits covered with spines. On the inside, the yellow flesh and the red aril (membrane surrounding the seeds) are the edible parts. 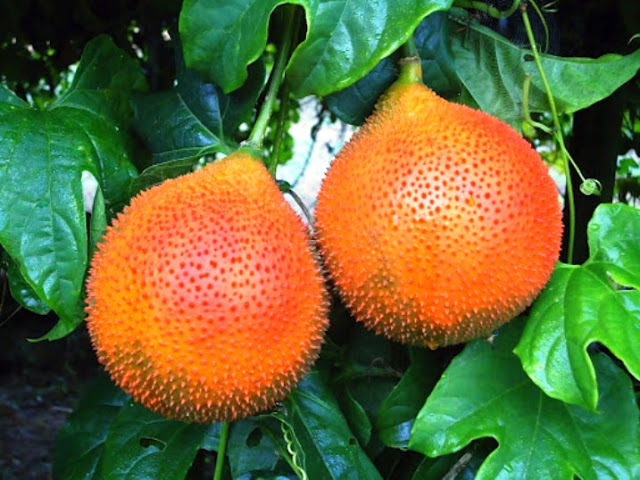 USES AND NUTRITIONAL VALUE – Sugod-sugod is gaining popularity because of its high carotenoid content, particularly lycopene and beta-carotene. 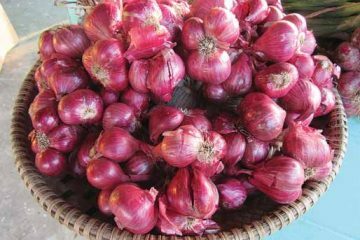 These are known to help reduce the risk of various types of cancer. Both fruit meat and aril contain high amounts of these phytochemicals, but these are found in higher concentrations in the aril. 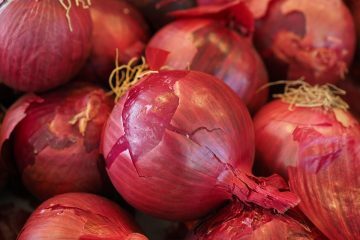 The lycopene in the aril can be as much as 705μg/g and averages at about 400μg/g. Sugod-sugod is also reported to have immunomodulatory, anti-inflammatory, antimicrobial, antioxidant, and antidiabetic activities. The oil extracted from the fruit is also found to be high in Vitamin E. Aside from the medicinal uses, the crop also has the potential to be used as a source of natural colorant for industries. 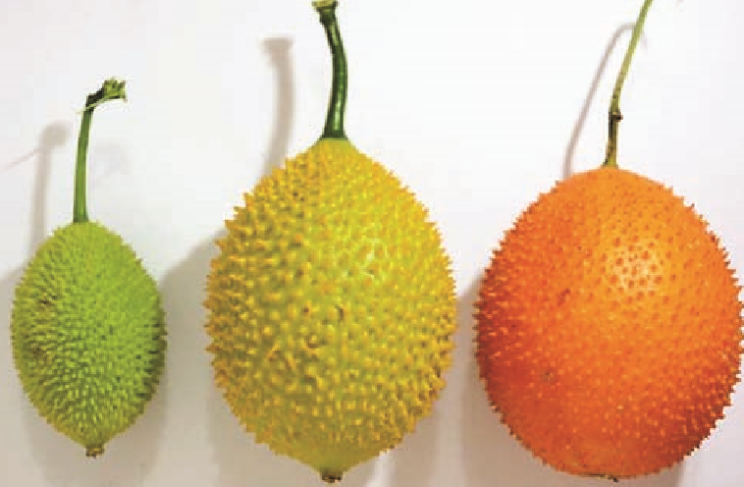 Varieties: Variations among the germplasm of sugod-sugod are observable in terms of fruit shape and fruit size. The different fruit shapes include round, elliptical with pointed end, oval, flattened bottom, oblate, and semi-cylindrical. Differences in lycopene and beta-carotene content are also observed. However, there are still no recommended varieties in sugod-sugod. Propagation and planting: Sugod-sugod can be propagated through seeds and stem cuttings. However, seeds can develop into either male or female plants. Thus, it is recommended to grow plants from the seeds then increase the number of female plants through stem cuttings. The cuttings are grown in a plastic bag filled with garden soil and compost for 3-4 weeks, after which the plants are transplanted 1 meter or m apart. Since it is a vine, trellising is required for plants to fully develop. Nutrient management: Initial basal application of fertilizer is done at the start of planting. Side-dressing is then applied once every two weeks until the fourth application starting at the 6-leaf stage. Fermented juices, manure tea, and other organic fertilizers can also be supplemented as the plants grow. Pest management: Among the important insect pests of sugod-sugod are the black, hairy caterpillars feeding on the leaves and fruits. 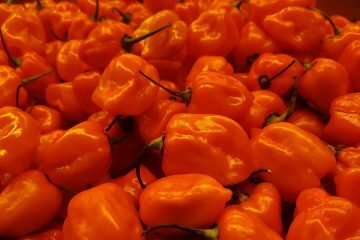 To control this, a hot pepper and soap solution can be sprayed on the insect pests. Harvesting and postharvest: Fruits of sugod-sugod change in skin color from green to dark orange as they mature. Once harvested, mature fruits should be stored at low temperature conditions (10OC, 90-95% RH) to maintain its quality. Under such condition, shelf life can be extended for up to 30 days. 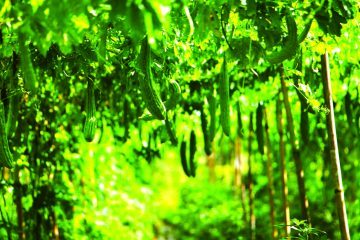 POTENTIAL – Since it is already established that sugod-sugod is a highly nutritious indigenous vegetable, it has a high potential to be developed as a functional food. Development of food products derived from processing sugod-sugod would help increase people’s awareness regarding its nutritional value. Its aril can also be a source of natural dye. RECIPES – Sugod-sugod in dinengdeng. Bring water and grilled/fried fish to a boil in a cooking pot. Add fish sauce before adding squash fruits, string beans, and sugod-sugod. Cook until tender. Finally, add malunggay leaves and cook for a minute or two. Xoi Gac Red Sticky Rice. Cut open the sugod-sugod fruit, get the red coating of the seeds, and put in a mixing bowl. Add 1 tbsp red wine and mix with glutinous rice. Add 1 tbsp of salt. Mix well until all the rice grains are coated red then steam rice for 15 minutes. Afterwards, add 2 cups of sugar and 1 can of coconut milk then cook for another 5 minutes. Serve hot.